AOL Mail is the email service from the internet company – American Online. This is the company that provides the latest news, weather reports and more. Basically, AOL is also based in other regions. So users can get their AOL home page customised to their regional aspect. AOL mail is a web-based email service. You can also use the AOL mail settings to receive on your preferred email clients. So make sure you follow the guide below. AOL Mail uses POP and IMAP server for email clients. However, it is better to use IMAP settings instead. How to Setup AOL Mail Settings for Email Clients? Run any email client that is on your desktop. Then, choose to Add Account. This is to add your AOL mail account to the email client. After that, choose to Manually Configure server settings. Then, choose IMAP or Internet E-mail option. Click on Next to continue. Now proceed to give your User information. This includes your Name and email address. Provide your password as well in the field provided. Then use the following IMAP & SMTP settings. These AOL mail settings are crucial when you setup email clients. AOL IMAP settings: imap.aol.com. Use Port Value- 993. Use SSL for encryption method/connection. 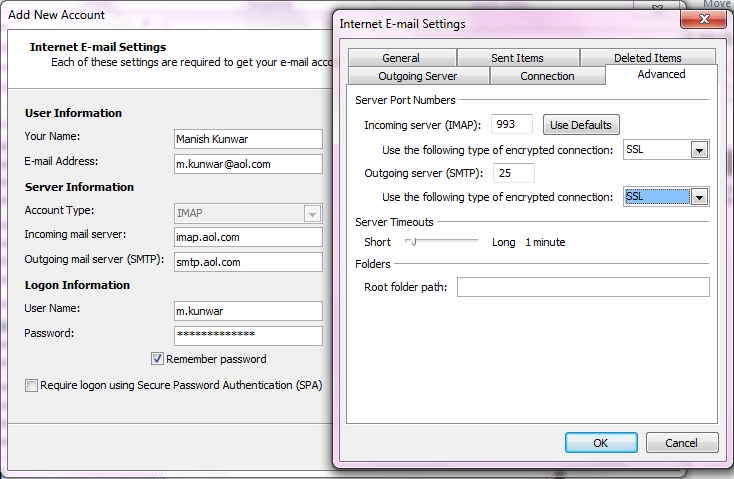 AOL SMTP settings: smtp.aol.com. Use Port Value – 587. Use SSL for encryption method/connection. Make sure you tick next to The outgoing SMTP server requires authentication. Then, your email client will test the connection. Once the connection is approved, it will show. You will also receive a test email from AOL on your email client. Below are the IMAP & SMTP settings for other regions than the US. Above are the using IMAP settings for your email clients. These AOL mail settings might not always be necessary. Sometimes all it needs is you type in your AOL mail address and password. This will give your email client access to your AOL email. If AOL IMAP settings do not work, you can configure with AOL POP settings. Click to Add Account for AOL mail. Then, choose to Manually configure server settings. After that, choose POP or Internet E-mail. So type in your AOL email address. It looks something like yourusername@aol.com. Then use the following AOL POP3 settings. For Incoming mail server: pop.aol.com. Port No: 995 and use SSL for encryption method/connection. For Outgoing mail server: smtp.aol.com. Port No: 587. Tick next to The outgoing server requires authentication. The above the AOL mail settings for your email clients. Please give us a feedback in the Comments section below. Also, you can check the rest of the site for email login help.